A series of Coast Guard search and rescues two weeks ago and a washed-up vessel now appear to be related. 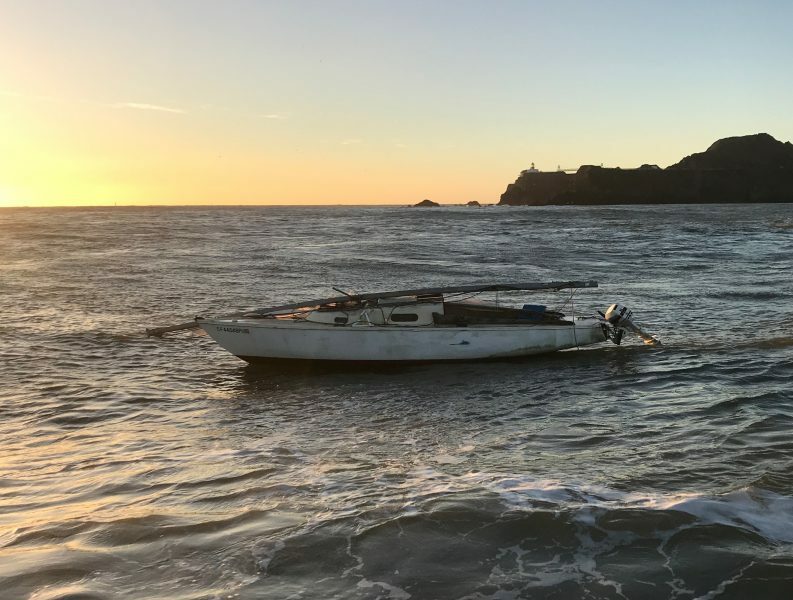 On January 21, the Coast Guard rescued three sailors from the 20-something-ft sailboat Pau Mua after it dismasted just outside the Golden Gate, knocking one sailor overboard. The rescue happened five days before the vessel washed up at Stinson Beach on Saturday, which we reported a week ago. Pictures taken of the Pau Mua by Coast Guard rescuers show its collapsed mast haphazardly lashed across the cabintop and a bright-white Johnson outboard motor serving as a rudder clamped to the stern. But there was no sign of the mast or outboard when Andy Spiegel and Katie Smith discovered the boat washed ashore a week later, although the cabin contents appeared largely intact. GPS coordinates embedded in the Coast Guard images place the rescue location near Bonita Cove, a little less than one nautical mile due east of Point Bonita Lighthouse. 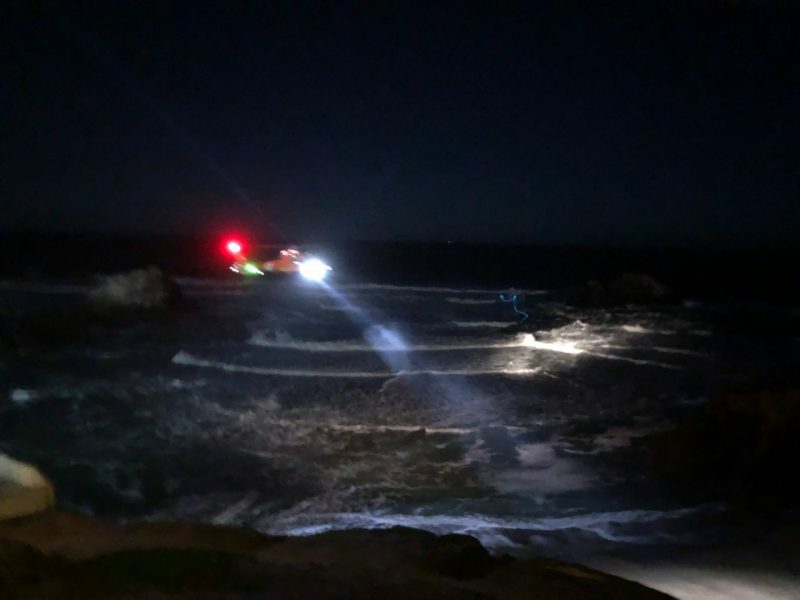 At the time of the rescue, the vessel was drifting southwest, Hill said, but it eventually came to shore at Stinson Beach some eight nautical miles to the northwest. The location of the rescue was taken from the GPS coordinates embedded in the pictures from the Coast Guard. Hill said the Coast Guard learned from San Francisco Police Department radio traffic on Channel 16 that the Pau Mua was in danger, but a police spokesperson was not able to confirm. 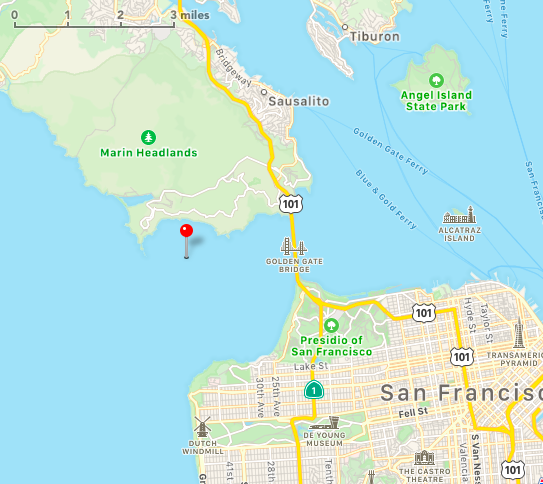 About an hour after the rescue, around 6:20 p.m., a photographer on land in San Francisco called 911 to report a sailboat appeared to be sinking approximately one mile offshore. Lt. Jonathan Baxter, a San Francisco Fire Department spokesperson, said they relayed the call to the Coast Guard. Hill said the Coast Guard — which was working without pay at the time of this incident because of the government shutdown — believes it is likely the 911 caller observed the Pau Mua adrift with no one aboard but conducted the search because they weren’t able to rule out the possibility of another vessel in distress. That caller was Peter Kay. “A photo of the Coast Guard helicopter searching by the Cliff House,” wrote longtime Latitude 38 reader Kent Carter, who put us in touch with Peter Kay. Even though the 911 call did not result in another rescue, Baxter did not want to discourage the public from calling if they see a boat in danger. On the same day as the Coast Guard rescue, a body was found at Ocean Beach in an unrelated incident. As we mentioned in Friday’s ‘Lectronic Latitude, Yann Guichard, the French skipper of the Swiss maxi-trimaran Spindrift 2, contacted his technical team ashore to report damage to the structure of the starboard rudder. 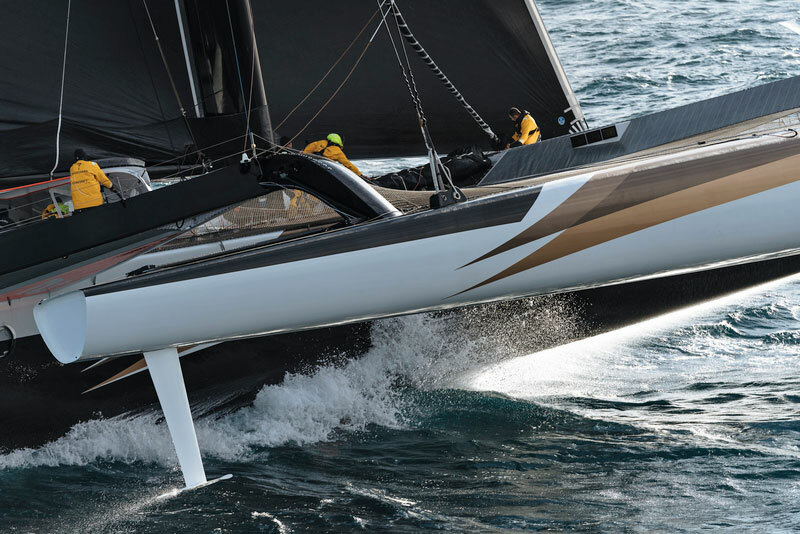 Spindrift Racing was challenging for the Jules Verne Trophy, a nonstop round-the-world crewed record. Spindrift 2’s starboard rudder, as photographed when it was intact. Later, in daylight, the team made a full assessment of the damage and possible repairs. Reluctantly, they concluded that they would be unable to make the necessary repairs without compromising the safety and performance of the 132-ft tri. “Because of this technical problem, we have no choice but to stop this record attempt. It is a huge disappointment to all of the crew. We are now heading to the southeast coast of Australia and expect to reach there in the next four days,” confirmed the 44-year-old Guichard. “I share the heartbreak of #Spindrift 2’s crew,” tweeted team co-founder Dona Bertarelli, “especially after such a promising start. So proud of them taking on the world’s greatest challenges. Wishing them safe as they sail to Perth and counting the minutes until I see my husband [Yann] and son again.” The crew expect to arrive in Perth on Wednesday morning. Bertarelli’s 21-year-old son, Duncan Späth, is a helmsman and the youngest member of the 12-man crew. Synthetic Standing Rigging. Why Not? We want to re-rig our 30,000 lb. Kelly Peterson 46-ft sloop Esprit with synthetic — yes, plastic — standing rigging, but almost everyone we talk to (except ‘young sailors’ and ‘old sailors’ who have it already) are telling us not to! What gives? If you’re new to this concept, let me enlighten you. Our friends Sonya David and Jack Patton have started to make the conversion on their Passport 42. They’re going old-school with deadeyes and lashings. A few of the reasons sailors are making the switch are: Anyone with a fid and access to some patience can rig their own boat; the rig is seriously lightened; it doesn’t rust, and you can keep a whole duplicate of the rig in your bilge; it’s two to five times stronger than the steel it replaced; and, did I mention, you can do it yourself without expensive and heavy equipment? Also, unlike a swage, the splices and thimbles are fully inspectable. So, why wouldn’t you do it? 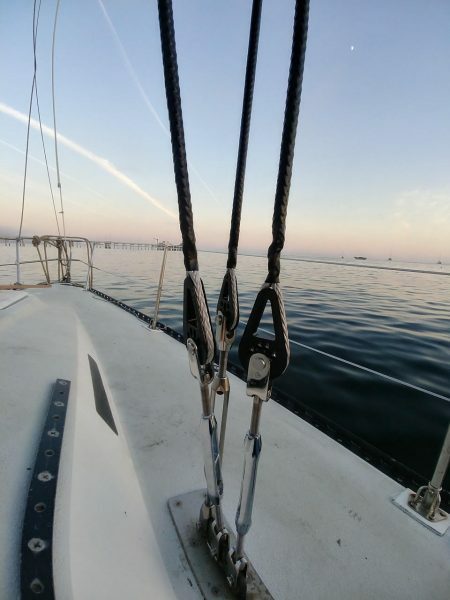 Most commonly sailors cite that plastic rope stretches, chafes, and is susceptible to UV rays. All of these reasons can be addressed. For stretch, the heat-treated fibers in Dux and STS-HSR have had all the constructional elongation removed before it goes onto the spool. Some of it comes back when spliced for standing rigging, but that can be accounted for and taken back out by setting it with a winch. “Actual working elasticity, at least if sized correctly, is less than that of 1×19 wire rope,” said Brion Toss, author of the Riggers Apprentice. 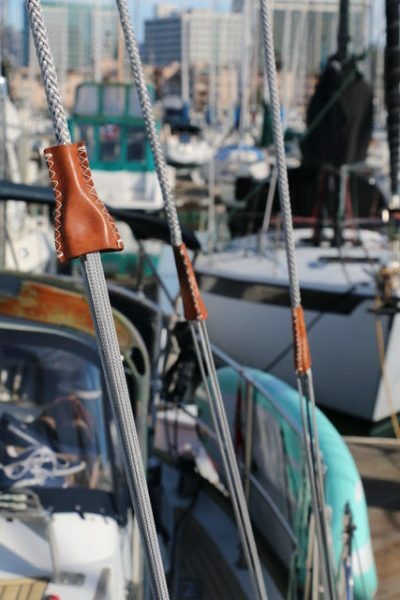 I also spoke with a local Bay Area rigger, and he saw a 50% reduction in breaking strength over a 12-hour period when he stretched a 40-ft length of Dux to 30,000 lbs. I can’t imagine any chainplate staying attached to a hull when that much pressure is applied! Thimbles specific for Dyneema rigging, these were manufactured by Colligo Marine. For chafing concerns, the rope can be dressed with chafe gear like — in this case — heat shrink tubing, by splicing on a Dyneema cover, or, if you’re really salty, one could serve and parcel the rope like we’ve done for thousands of years. For UV concerns, you could dress the whole rig like above, or, just keep an eye on it — as you should anyway. Just like all rope, there are visual signs of stress and age. “It is also much more resistant to UV damage than, say, Dacron or nylon.” Toss said. When chafe or UV becomes a problem, the line turns fuzzy. This is a warning sign to replace. Colligo Marine has charts of UV data for Dux. However, remember that Dyneema is two to five times stronger than the steel it replaced! A local rigger agreed to help us make the switch, but said they were confident I’m someone who will have the wherewithal to do something about the maintenance. “For people unlike you, I would still tell them to use conventional materials,” they said. One last question: Will my insurance drop me if I take the leap? That’s my biggest concern! “Lloyds of London have approved Dynice Dux for strength.” John Franta said. So honestly, tell me why you wouldn’t do it? I’m still on the fence myself, but I have both feet headed in the direction of modernizing our rig. From my research, there are no documented disasters from this technology in the 12 years that this stuff has been in use. What am I missing that I can’t find on the Internet or from the professionals I’ve asked? We’d like to hear from you. You can either comment below, or email us here. 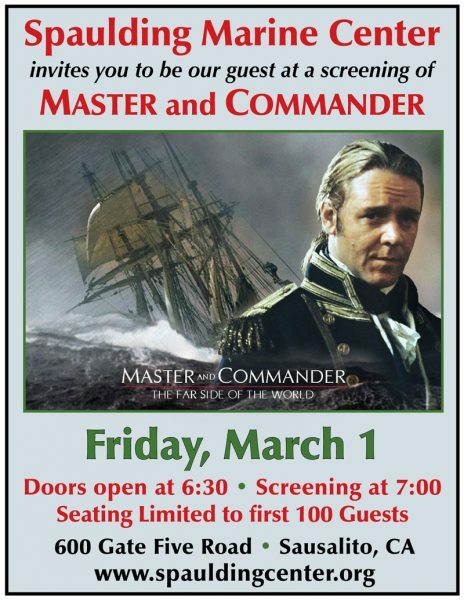 Please be sure to include your Boat Name, Make and Port of Call. Mark Slats, 41, took second place in the nonstop, round-the-world, solo Golden Globe Race last night aboard his Rustler 36 Ophen Maverick. SailGP is embarking on this, its inaugural season. The tour will come to San Francisco on the weekend of May 4-5. Tickets will go on sale on Thursday, February 21, at SailGP.com/SanFrancisco. The problem is not severe. It can barely be called a problem at all. But if you're sitting down and helming on a long, slow run on my boat, you'll find that you have to hunch over — almost imperceptibly — to steer. You might even notice a little cramping creeping into your shoulders and back. The tiller seems as if it's just a little too low.